Investigators say he knew all of the residents would be sleeping when the fire was set. SPRING HILL, Fla. -- A man faces attempted 10 counts of first-degree murder charges after being accused of setting his ex-girlfriend's home on fire. The Hernando County Sheriff's Office and fire department responded to the fire around midnight on July 23. When they arrived, the back of the house was engulfed in flames and the fire was quickly spreading to the roof. Deputies and first responders said they believe the fire had been intentionally set. A resident of the home noticed the fire and everyone was able to get out of the home safely. 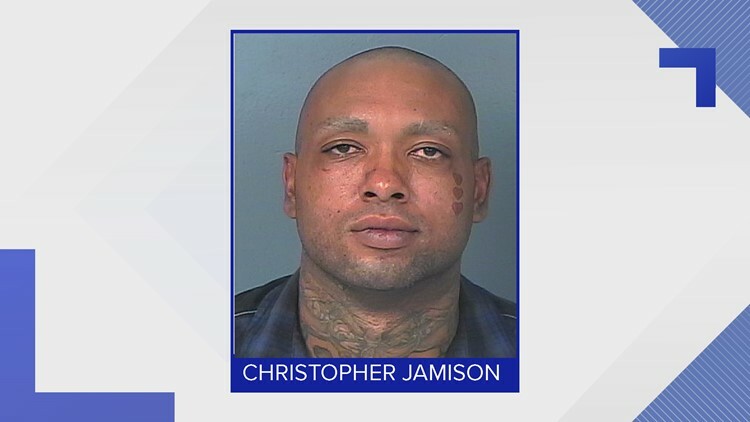 A further investigation was done and investigators said they discovered that Christopher Lamar Jamison, 27, went to the home around midnight and intentionally set the lanai of the home on fire. Jamison had been in a relationship with one of the residents of the home and allegedly set the fire near her bedroom. Investigators said he knew all of the residents would be sleeping when the fire was set. His ex-girlfriend said she and Jamison had broken up two months before the fire and that she had refused to get back together with him. She said Jamison threatened to burn her home down in front of her brother and told her that nobody was going to tell him that he couldn't be with her. Following the fire, a domestic violence injunction was filed against Jamison and he was not allowed to have contact with her, according to documents. She was contacted anonymously and investigators discovered that he was responsible for the message. Investigators said Jamison admitted to setting the fire in the message. He was arrested Thursday and faces 10 counts of attempted first-degree murder, arson, and aggravated stalking charges. He doesn't currently have a bond set.